Mummy’s Gold is a good Microgaming casino and here we’ve analyzed its pros and cons! Would you like to play in an Egypt-style Microgaming casino with more than 250 games and generous bonuses? Read this Mummy’s Gold review in order to know everything about this casino! It’s a quite old casino, which has been working since 2002. The main advantages of Mummy’s Gold casino are high payouts, exciting Microgaming games, professional support (live chat is available 24/7) and loyalty program. However, there are some problems with it: American and British players can’t play here, welcome bonus is not very good and wagering requirements are quite high. In this review we will tell you about each of the pros and cons, but at first we’ll talk about the licenses. Let’s go. Licenses and certificates. Is it safe to play here? Yes, Mummy’s Gold is a safe casino. It’s licensed by Maltese authorities and it has an eCogra certificate – and if you are a beginner or don’t know anything about it, we’ll tell you what does these two names mean. So, the online casinos need licenses in order to work properly. A license is a guarantee for the customers that their money will not be stolen, and it also guarantees that the winnings will be paid to the players. If a jurisdiction that give the license is trusted, it checks a casino very carefully to make sure it’s safe. Licenses do also guarantee the transparency – thus, if a casino is licensed well, its random number generators are really random and all the games are fair in it. Maltese authorities (it’s actually the Lotteries and Gaming Authority who issues licenses to the online casinos) is a good and trusted jurisdictions, moreover, it’s one of the best jurisdictions possible, along with the United Kingdom Gambling Commission and Curacao Gaming Control. This license guarantees all these things we’ve just told you: the protection of your private and financial information, the fairness of the games, the guaranteed payouts, etc. It means that (again) Mummy’s Gold is safe – even if you don’t know nothing about all these licenses and jurisdictions. Another thing we usually evaluate is the existence of different certificates, which guarantee fair gaming and protection of the customers. These certificates aren’t issued by the authorities of different countries – only by the independent agencies. One of the most trusted independent agencies of this kind is eCogra (which is for Ecommerce Online Gaming Regulation and Assurance) – and we don’t add the casinos without a certificate from eCogra to our lists. Of course, Mummy’s Gold online casino has such a certificate. This casino offers a fair and transparent gameplay, as well as services, which protect the customers. Fair gaming, protection of the customers, their money and privacy, combating the frauds, honest marketing (without unreal bonuses) – that’s what we like in casinos, and that’s why we’ve added Mummy’s Gold here. Which countries are restricted in Mummy’s Gold casino? What about the USA, the UK, Canada and Australia? Well, it’s probably the weakest side of this casino. Unfortunately, it’s restricted in more than 20 countries – among them you can find the United States of America, the United Kingdom, Turkey, Spain, France, Denmark, Belgium, South Africa and other countries. The good news is: if you are from Canada, you can play in Mummy’s Gold without any problems. The same is for the German, Indian, Chinese and Russian players (and the residents of hundreds of other countries). However, it’s not an intractable problem. If your country is in the restricted list, you can always use VPN or anonymous proxies in order to access the desired website – and it works for Mummy’s Gold casino. Well, at least they didn’t make any statements about prohibition of proxy servers. But please, at first make sure it’s not a criminal offence in your country to use such instruments and services. Bonuses in Mummy’s Gold casino. Any no deposit bonuses or free spins for new players? Well, no, there are no free spins and no deposit bonuses for the players here. However, the welcome bonus is quite interesting… But don’t expect too much from it. Unfortunately, promotions are not the strongest side of this casino. Let’s see. So the welcome bonus here looks very generous: they give you 100% of your first deposit, but not more than $500. It’s a little bit more than the majority of the casinos do usually offer, but here is one little problem. This bonus is cashable, like all the welcome bonuses – but the wagering requirements are very high for this one. You will have to wage this bonus 50 times in order to withdraw it, and let’s be honest, it’s a very high number. All in all, it’s not the best promotion offer, because many casinos have the same bonuses but with much lower WR. But that’s not all. As you probably know, the casinos often cheat a little with bonuses – they say that the wagering requirements are 20x, for example, but it counts only if you play certain types of games. Here we see the same situation – in Mummy’s Gold, 50x wagering requirements are really 50x only if you play slot machines! It means that, well, this welcome bonus is useless for those who can’t play slots or just don’t love them. There is also a loyalty program in Mummy’s Gold casino. They have six levels of loyalty (each one has its own colour), and the more you play, the more bonuses and gifts you will get – the system is very familiar if you’ve ever played in online casinos. What is more, the Diamond players (the fifth level of loyalty program) get their withdrawals faster, and they are sometimes invited to some sport events. Oh, and such players have their own account manager! If you want to become a diamond player as fast as possible, we recommend to play American roulette or slot machines – at these games you will get 1 point for every $10. As we’ve said, there are more than 250 casino games in Mummy’s Gold. It’s not the highest result (some casinos offer more than 800 games! ), but it’s still a good number which would be enough for the majority of players. All these games are provided by Microgaming – and that’s why we will not return to the quality of the games no more. This name speaks for itself. You can choose among roulette, blackjack and other table games in this casino. Of course, slot machines, video poker and craps are available, too. All the games are organized by category in order to make it more conveniently for you to find what you need. Interesting fact is: you can play any of the games here for free, without even making a deposit – to do this, you’ll need to have a guest account. So there are more than 100 slots here – you can play traditional 3 reel slot machines, modern 5 reel slots and even progressive jackpot slots. Feature Slot Games are available, too – it’s a section with themed machines. And of course, you can play on many slots at a time with their “mega spin” feature. Table games are good here, too. There are many different types of blackjack (multi hand, bonus or double exposure), roulette, video poker, keno and other games, like scratch cards. What we want to say is that despite there are only 250 games, the assortment is still quite high and you will most likely find something interesting for you here. Support service. Will they help? 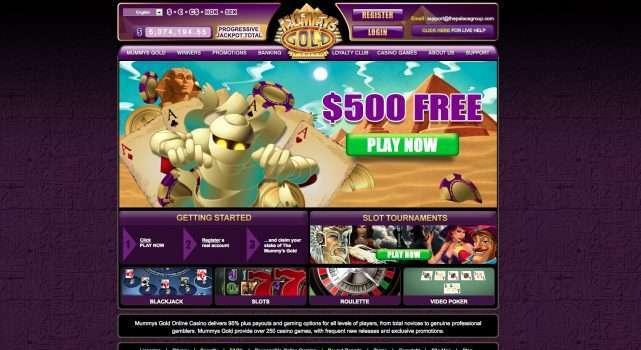 Mummy’s Gold casino has a live chat, which is available 24 hours per day and 7 days a week. They can answer you in multiple languages, they answer fast and they really help. Well, in most of the cases. If live chat isn’t for you, you can also call them or write an email (it’s a little bit slower, but it still won’t take more than 24 hours). And of course, some players complain that the support service doesn’t work as it has to. Some people say that they answer slowly, the others write that their answers didn’t help at all – and we understand that such cases are an integral part of every casino. Sometimes it’s all about the human factor, sometimes – about internet connection or lags. We understand that there are no casinos without such feedbacks, and that’s why we still can recommend Mummy’s Gold. No one is perfect, that’s right – but this casino is trying to become the perfect one. Withdrawals and deposits. How to withdraw winnings and are there any problems with it? The payout percentage is very high in this casino (98.49%), so you will most likely withdraw your winnings sooner or later. Let’s talk about this process in order to make it clear. The number of withdrawal options is not very high. You can use checks, Neteller, Pay Spark, PayPal, EcoPayz, Qiwi, Skrill, credit and debit cards and direct bank transfers. If you choose the latter, you’ll have to wait up to 1 week to get your money. It would be a little faster to withdraw the funds to a credit card (2-5 days), and electronic wallets are, as usual, the fastest way to get your money (1-2 days). Of course, checks are the slowest (up to 2 weeks). Players can withdraw only $4,000 a week, but only if $4,000 if five times more than their total deposits. We haven’t found any negative feedbacks related to withdrawal.